Where does one go in Newark, Ohio for all of their landscape supplies? Hope Timber Garden Center has all the Newark Ohio landscaping supplies you would possibly need at one place: From flowers to trees and everything in between. Stop in now and check out our selection of pots and hanging baskets. We’ve got petunias in packs of 6, and the hydrangeas are blooming—perfect for beautiful color all summer long. Hope Timber Garden Center has annuals, perennials, flowering trees, shrubs, and so much more. We’ve got something for everyone. Looking for landscape stone and gravel? We’ve got bagged rock and rock by the skid steer scoop. So if you want to create a simple garden path or a complex patio, stop in to see what we have to offer. 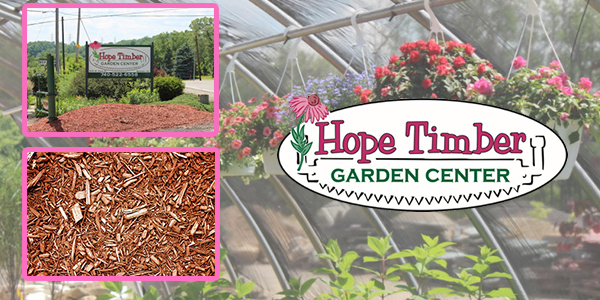 Hope Timber Garden Center is also the best place in Licking County to get all of your topsoil and mulch. We have topsoil and mulch in bags and also in bulk. We also offer delivery. Call us at 740-522-6558 for more information on pricing or for delivery. Hope Timber Garden Center has all of your needs for beautifying your yard and getting all of your Summer DIY projects completed. Stop by and see us! You won’t be disappointed. While you are here, don’t forget to stop by the 3 barns loaded with unique vintage collectibles. Hope Timber Garden Center is the home of Newark Ohio landscaping supplies! The bags are rounded up.